How much time do you spend sitting? If you work in an office, chances are it’s an average of around 11 hours a day and that most of your time spent sitting happens at work. By now, you’ve probably heard that spending too much time sitting isn’t great for your health. Too much sedentary time may increase the risk of heart disease, diabetes, cancer, and overall mortality. 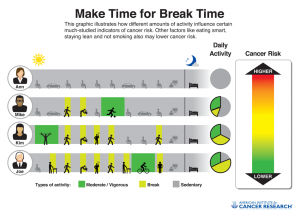 Making an effort to move more throughout the day may lower your cancer risk and improve your overall health. In order to help their employees sit less, some employers have installed special desks that can be raised or lowered so that workers have the option to sit or stand. But in order for sit-stand desks to work, employees must use them. Today, a new study found that replacing even a small amount of that sedentary time with some physical activity could reduce early death for people of all weights and waist sizes. A growing body of research is linking sedentary behavior to cancer risk. The new analysis, published in American Journal of Clinical Nutrition, used data from over 334,000 people in the European Prospective Investigation into Cancer Nutrition (EPIC) study to determine if overweight, obesity or large waist size would affect whether reducing sedentary behavior improves survival.